Other Artists | JP Rankin "The CARTOON COWBOY"
The rest they say is history … have not seen Dave since 2000. Signed by the author John Erickson and “ACE REID”! 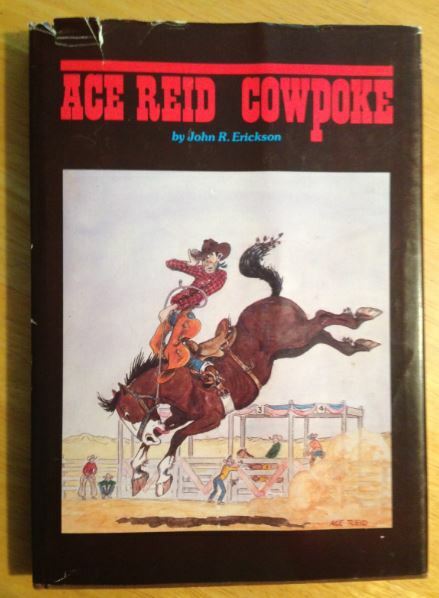 So I was saying the other day that this was the book I read by John Erickson that got be introduced to Jody Logsdon with Laid-Back West Syndicate and that is when I started having my cartoons published in American Cowboy, Western Horseman and Cowboy Sports & Entertainment …. I loaned my copy out and never got it back. I found this one on the internet the other day for $9.00. When I was in Kevin’s shop I also noticed this pencil drawing hanging on the wall … Kevin said that his Granpa did this artwork in 1947 … thought it was very cool! Check out some of Kevin’s work at ….